Organic vs. Non-GMO: What's the Difference? Whether you're a parent or currently expecting, you've probably come across the ongoing organic” vs. conventional debate when it comes to what goes into your child's body—and with good reason since babies can be more vulnerable to environmental toxins. But, what about organic vs. Non-GMO? You're not alone if you're thinking Non-GMO may be like organic, but that's not inherently the case. Should I choose organic baby formula or Non-GMO formula? What about when it comes to milk and skin-care products? Do I buy organic or Non-GMO varieties? 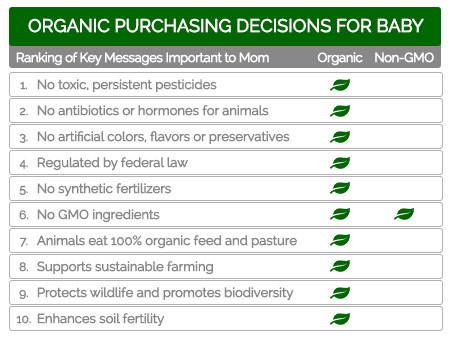 A recent study revealed that more than half of moms didn't know that organic is inherently Non-GMO. It's important to understand the difference between these labels so you can make the best choices for you and your family. Looking beyond the Non-GMO label doesn't have to be an all-or-nothing approach. Learn more about why you should choose organic.